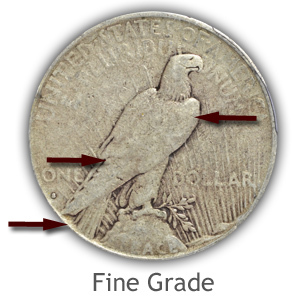 Grading Peace silver dollars follows a process of judging defined areas of the coin's surface. Signs of wear, the amount of wear and overall condition are then compared to grading standards. Key elements to grading are detailed in the video, and the images and descriptions that follow. 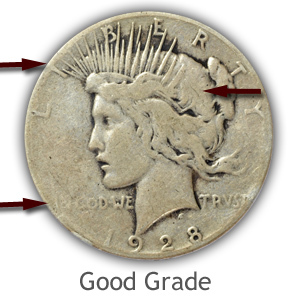 Each grade of a Peace silver dollar has its own unique features. Uncirculated coins retain the texture of mint luster. Lightly worn Extremely Fine grade examples are noticeably sharp with detail. 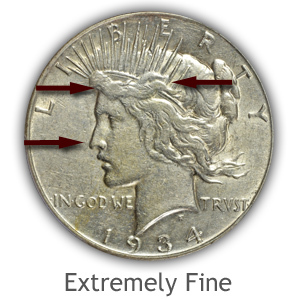 Fine and Good condition coins show moderate to heavy wear. Subtle details to grading are needed to separate these different conditions. A premium grade Peace silver dollar is the Mint State - Uncirculated condition. Essential to the grade is the presence of mint luster covering the entire surface. Luster is the result of a fine texture to the metal from the minting process. A single light source and tilting the coin to reflect the light from both a high and low angle aids in confirming complete mint luster. Delicate, this "frost" must remain on the key high point areas listed to reach the uncirculated grade. Confirm no trace of wear is visible in the loose hair just above Liberty's eye. Inspect hair below the edge of the cornet and strands flowing upwards into the spikes. These high areas would quickly show a dullness if worn. Hair on the back of the head near "T" of "Liberty" luster must cover all areas of the loose knot. Additionally the neck line above the date is exposed to early circulation wear. Overall the cheek and chin must retain luster. Dullness and smoothness indicates wear. View at a low angle the very top of the right shoulder of the eagle. Mint luster remains with no smooth dull appearance. Outer edge of the left wing retains all texture, fine lines of design and mint frost. Eagle's head and behind the eye show a nice covering of luster, no dulling is present. The forward and center areas of the neck are high in profile, judge for missing luster, fine feather detail and texture. Light, even wear is visible on an Extremely Fine grade Peace dollar. Wear is confined to the highest areas, allowing for some of the lower relief fine details to remain. Mint luster is replaced with an overall silver grey sheen. Luster remaining in small protected areas of the lettering and rays adds to the appeal and strengthens the grade. Of Note: Contact marks are taken into consideration in the Extremely Fine grade. 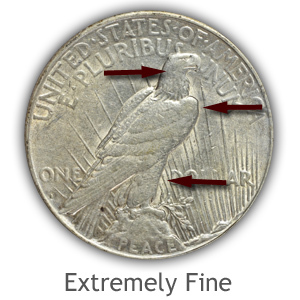 Heavy or deep marks are a cause to down grade the coin. The distractive nature of any mark is considered in the overall eye appeal of the surfaces. A small flattened area is visible to the hair above Liberty's eye. Additional minor flatness is visible on the upward flowing hair into the coronet and spikes. None of these smooth areas are connected and within the separations are finer lines of detail. Only a small flat area is noticeable to Liberty's nose. Minor wear and smoothing in seen on the center of the neck and check below the eye. Ending neck line just above the date, once contoured upward, now shows a leveled, flat appearance. Wear has merged only the finer lines of detail within the feathers in the areas of the neck just below the eagle's eye, right wing along the shoulder and the front edge of the leg. Head detail above and around the eye remains with slight flatness and merging. On the right wing three rows of feathers are intact and visible. High relief detail of the rocky crag is smooth with some texture remaining. Lettering of "Peace" is weak in spots but complete. 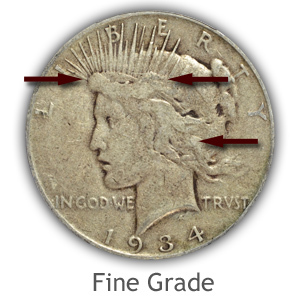 A few of the minor fine line details remain on a Fine grade Peace silver dollar. Although wide areas of wear are noticeable, key elements to the hair, lettering and eagle are visible and in some cases bold. 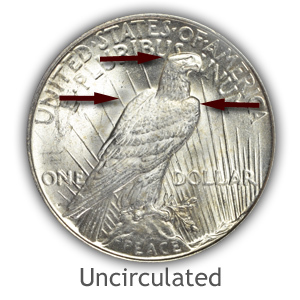 A subtle point to observe is the design on both the obverse and reverse still retains a certain raised, contoured appearance and roundness to Liberty and the eagle. This roundness in the relief is the judging confirmation placing this coin above a lower grade. Hair above Liberty's forehead is smooth overall with some detail towards the ends. Strands of hair rising upward into the spikes, although flat in areas, retains separation of the strands. Separation of the major details of hair trailing behind the ear remains. Tie of hair at back of head shows separation of knot and some roundness to the profile. Rim complete and all letters of "In God We Trust" readable. A complete rim is visible. In the fine grade the rim is attempting to fade in places, however must remain raised from the field in this condition. Although fine feather detail in now smooth the body and neck of the eagle remains with a distinct raised and rounded profile. Horizontal line of last row of feathers is visible on the right wing. Rays over left shoulder of the eagle are often weak as well as the beginning letters to "E Pluribus Unum" are faded. View at a low angle to confirm some detail remains. Tops of the letters in "Peace" are beginning to merge with the crag. 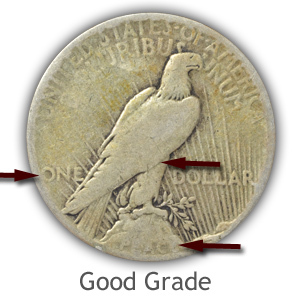 In the Good grade a Peace dollar is worn noticeably flat over wide areas of the surface. Merging of details has removed many of the finer elements once enhancing Liberty and the Eagle. Remaining however, is a clear date and much of the lettering. A rim fading into the lettering is a key point in holding a coin from a higher grade. Overall, the Peace dollar fairs well as it circulates and become worn. Eye appeal does however have an impact on the Good grade. Loss of detail can cause the appearance to have a washed out hazy appearance. Areas of boldness impact the sharpness to the coin's appearance adding to appeal. Although hair detail is heavily worn, portions are separated; strands flowing into the coronet, strands near the neck line and a loose knot at back of head. Rim merges with the tops of lettering in areas; lettering does remain readable. "In God We Trust" faint but only fading at areas near the rim. Liberty's portrait is bold from the field. Heavily worn rim, merging with lettering and field. Eagle an outline, with a neckline remaining and a separation of the wing from leg and tail feathers. Letters to "Peace" at the bottom rim all but missing. Any boldness here indicates a strong for the grade dollar. Stylized sun rays often quite faded behind eagle but should remain in front of the eagle. One hurdle to overcome when grading Peace silver dollars is the problem of taking into consideration a softly struck coin. Peace dollars, because of size, pushed the limits of the presses and coining dies in the striking process. Fine tolerances must be maintained with die alignment and pressure to both avoid destroying the dies and getting an acceptable life span of the dies. Millions of coins were produced at three different mints and no one die was expected to last a year of production. Multiple dies were used resulting in mutable production run setups adding to the inherent problem of fulling striking a coin. As a grader, awareness and consideration of strike quality helps in determining condition, assigning a grade and placing a value. Although a soft strike can be found on most dates and mints of the Peace dollar series, the San Francisco "S" mint coins account for the majority. In particular the following dates are usually found weakly struck. 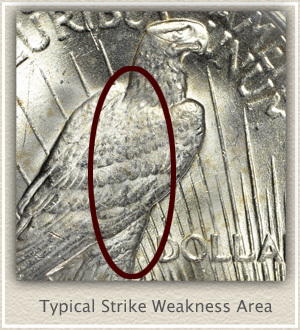 Strike weakness is less of an issue with coins in Fine and lower condition. Overall wear tends to diminish the impact of a soft strike on grade and change value. 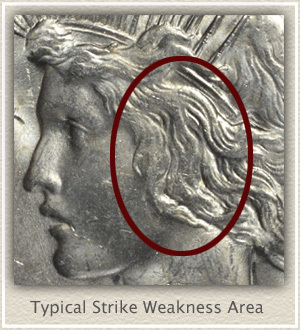 In higher condition coins, judging weakness in strike from wear is necessary. A softly struck coin, has in places, a distinct flatness to the normally rounded profile design elements. Metal simply did not flow into and fill these high points. As an example, and looking outside the potential "weak zone", wear in this hypothetical case indicates an Extremely Fine grade condition. However the highest parts of the design within the weak zone are in worse condition. This condition indicates the coin was never fully struck completing the design and the missing detail is not the result of wear. Technical grade is Extremely Fine with the modifier of Weak Strike. Overall visual appeal now adjusts value. If the presence of a soft strike is minimal to the ascetics of the coin only small value adjustments are made. An additional consideration is also given to the "color" or toning to the coin. Silver is reactive to the elements and turns color, reducing the original bright blue-white of an untoned surface. Judge the toning to your coin. Peace silver dollars naturally fade from a bright white to a soft silver grey with darker deep greys within the devices. Unnaturally dark surfaces overall indicates the coin was stored in an adverse environment. Cleaning is never advised and should not be attempted to restore the color to the coin. Cleaning results in just another different unappealing surface. Best practice is leaving the coin as is. Collectors often accept deeper degrees of toning. Accurately judge the condition of your coins yourself. Video index to the different coin series, with detailed images and descriptions. Grading the condition of Peace dollars locates on the charts an accurate value. All dates and mints listed with information about the importance of mint marks. Us coin values. 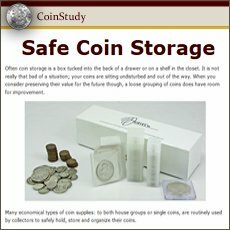 Image links to the difference series and value charts quickly finds how much your old coin is worth. 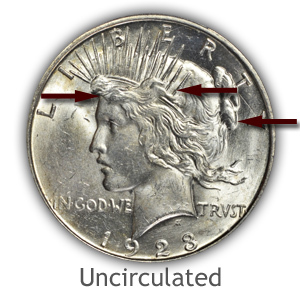 Subtle details to mint mark location and judging the condition of coins is found with each series from cents to gold.